The connection between oral health and heart disease appears to be due to bacteria. It is possible for bacteria in the mouth to spread through the blood stream to other parts of the body. If they reach the heart, the bacteria can attach to virtually any area and cause inflammation. Endocarditis, or an infection of the heart’s inner lining, as well as clogged arteries and even stroke have all been linked to inflammation from bacteria that originated in the mouth. 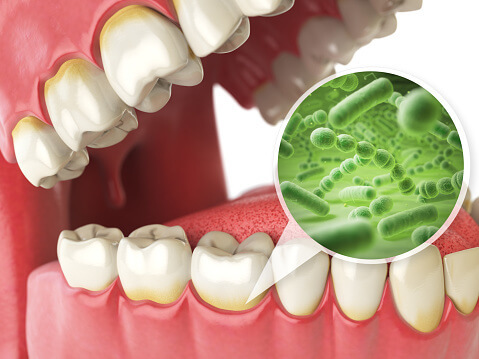 Patients with unmanaged chronic gum conditions such as gingivitis or advanced gum disease are at the highest risk, as the bacteria associated with gum infection can easily enter the blood stream. Even if your gums are not noticeably inflamed, though, accumulated plaque or tartar can also increase your risk. In some cases, oral bacteria in the blood stream can cause elevated C-reactive protein, a marker for inflamed blood vessels that can increase your risk of heart disease or stroke. Strong oral hygiene routines and regular dental exams are the best protection against gum disease. Brush twice per day with a soft-bristled toothbrush that easily reaches all surfaces of your teeth. Always use an American Dental Association (ADA) approved toothpaste. Floss at least once per day, and see your dentist twice per year for a professional cleaning and exam. Gum disease is a widespread problem in the United States. Untreated, it could lead to a variety of physical health issues, including raising your risk for heart disease. Taking proactive steps to keep your teeth and gums clean and healthy is a relatively simple way to protect both your smile and your overall health.